The features in this laptop are mind-blowing. The performance is reliable. Screen resolution is way above most of its rivals. The graphics and Ram ensure that you get quality videos without lag. This is the best system within its price range in the market. The battery life is sufficient enough for portability. Quality resolution and color support. USB-C port for fast data transfer. The Ultra HD touch screen. Little heavier than most of its competitors. Its screen is glossy with no options for configurations. ASUS ZenBook Pro UX501VW 15.6-Inch 4K Touchscreen Laptop (Core i7-6700HQ CPU, 16 GB DDR4, 512 GB NVMe SSD, GTX960M GPU, Thunderbolt III. Whatever you are working on, you might need PC that can offer better than an ordinary laptop. More often than not, such a powerful system could see you part with a whopping $2,000. You do not have to worry about that anymore. Thanks to the affordable Asus ZenBook Pro UX501VW laptop, you can be sure to get the best performance for less. The PC comes with brilliant specifications including an Intel Core i7 CPU, 512GB SSD, 16GB RAM, and discrete NVIDIA 960M graphics card. You won’t believe the price for this machine: it is in the range of $1,400. It has proven the best deal amongst its competitors. 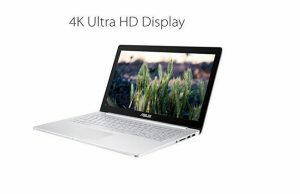 From its Ultra HD touchscreen resolution making it the best machine for editing videos or photos. Just like its counterpart, the Asus K501UX gaming laptop, it has a sturdy aluminum body frame making it very admirable. The 15-inch multimedia PC is made for perfection! Just to put everything into perspective, the Asus ZenBook Pro UX501VW machine from Asus comes in a unique design. It has an all-aluminum chassis that is topped by the renowned company signature on the lid. The metallic gray cover is made with polished edges on the sides. There is more concentric ring when you pry open the lid. Some are next to the keyboard with sufficient metal deck to rest your palms. The keyboard has a long stroke to offer the best typing experience. For those who are used to a keyboard with short travel, you need some time to get used to this one. The half-size Shift key on the right is, however, a trade-off for the Asus. Video pros find this very convenient while typing is affected at first. The system comes with a 4 x 2.75-inch touchpad. It is smooth with a silver matte finish. This makes it easy to blend in with the metal deck. It has effective click and multitouch gestures including the two-finger scrolling and zooms through pinching. From the first look, the circular patterns appear to be hiding the speakers. The sound comes from a set of speakers located on either side on the bottom of the laptop. The audio feature is incredibly blended into this system. The 15.6-inch UHD 3840 x 2160 touchscreen is the best deal for photo and video editors. From the NEC desktop monitor comparison, the photos and videos from the ZenBook Pro looked much alike, except for the blue tint that is subtle. However, the shiny coating keeps a reflection of whoever is in front of the machine. Color Accuracy (Delta e) – 4.37, which is relatively below average. Color Gamut (sRGB) – 111 percent, this is very strong. Brightness – 289 nits, which is comparatively strong. 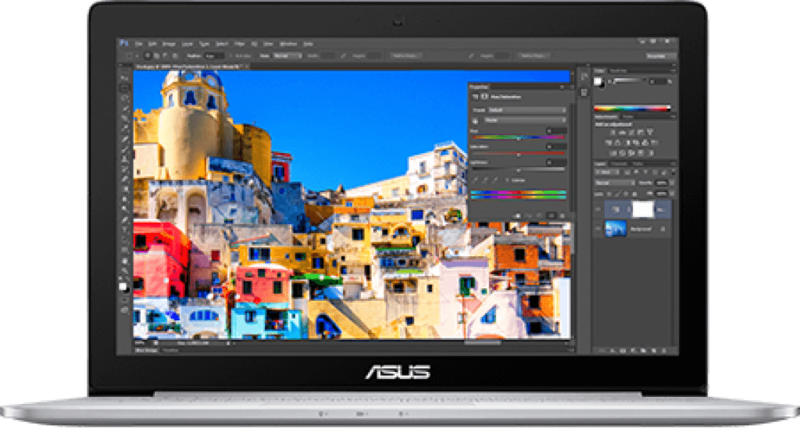 While most systems suffer from high-end graphics, the Asus ZenBook Pro UX501VW Laptop can handle the heat issues. It can handle video streaming without having to heat up the fans beyond 95 degrees. The space between the G and H keys is even cooler. The touchpad remains cool throughout the system use. At high settings, the ZenBook Pro can register 38 FPS, way better than most rivals like the Dell XPS 15. ZenBook Pro comes with a USB-C connection, which is super fast and supports Thunderbolt 3. This is in addition to the usual USB 3.0 ports. The exteriors are fashionable. It has sufficient ports for external display as well as superfast data transfer, SD card reader, HDMI 2.0 and headphone and microphone jack. The dark selfie photos from the webcam may not be very impressive, though, but the camera works for live video chats. With the NVIDIA 960M GPU and a 2GB VRAM, this ZenBook Pro delivers quality videos. It has a score of 4,308 against most competitors that have scored approximately 3,949. It can be used for gaming thanks to the graphics memory. The battery life is a staggering 8 hours making it the best deal for mobility. You cannot complain while browsing all day. The device features an Intel Core i7-6700HQ processor with 16GB of system memory and 512GB SSD. The machine has a reliable capacity to browse, perform word processing, and stream videos even with over 15 tabs open. The $1,499 price tag makes it the best deal in the market considering its mind-blowing features. The features are just mind-blowing. The performance is reliable. Screen resolution is way above most of its rivals. The graphics and Ram ensure that you get quality videos without lag. This is the best system within its range in the market. The battery life is sufficient enough for portability. This is complemented by its relatively lightweight. The design is modern. Hope you enjoyed reading through. Keep coming back for more unbiased reviews. Comment and share below.